We’ve all heard the old joke about two CEOs debating whether they should train their employees and be afraid that they will leave to work at some other company or leave things as they are and “enjoy” the retention of poorly-skilled people. Today, all executives know that those who ask themselves “to train or not to train” are doomed. To answer the above-mentioned question, let’s look at the latest reports, which show that a significant interest of companies is in increasing the share of training budgets. Today, everybody knows that smart learning platforms have a direct impact on business KPIs that, in turn, allow for the growth of the LMS market. A study by Research and Markets predicts that the global corporate LMS market will grow from $2.06 billion in 2018 to $7.12 billion by 2023 at a Compound Annual Growth Rate (CAGR) of 28.2% during the forecast period. Another report states that interest in digital learning, seeking cost-effective training tools, a great demand for continuous learning and upskilling, mobility, smooth communication, and a need to see measurable business outcomes draw the corporate sector’s attention to the LMS market more and more. This is predicted to result in a notable LMS market share growth of more than 65% by 2020. Cait Etherington, writer and training leader, points out one more factor that plays a critical role in the upsurge of the LMS market: the ongoing reskilling of employees throughout their careers. She believes that the influence of the Fourth Industrial Revolution will be disruptive for all industries—especially the transportation sector and the financial services, which will experience a lot of changes between now and 2020. Aware of these disruptive changes, IT companies have already reconsidered their companies’ budgets for the 2019 calendar and fiscal year. Apart from investing in security and cloud services, 44% of tech professionals see employee training as a top priority, which is why learning budgets are on the rise. In fact, all businesses that don’t want to lose their competitive ability or face talent shortages in the future need to focus on ongoing employee training, be it the onboarding of new hires or the upskilling of existing staff. Changes will affect every industry, so embracing a culture of continuous learning and equipping your people with the latest knowledge will future-proof any organization. And to make this learning culture effective, it’s crucial to have a holistic learning platform that integrates all major aspects of work. 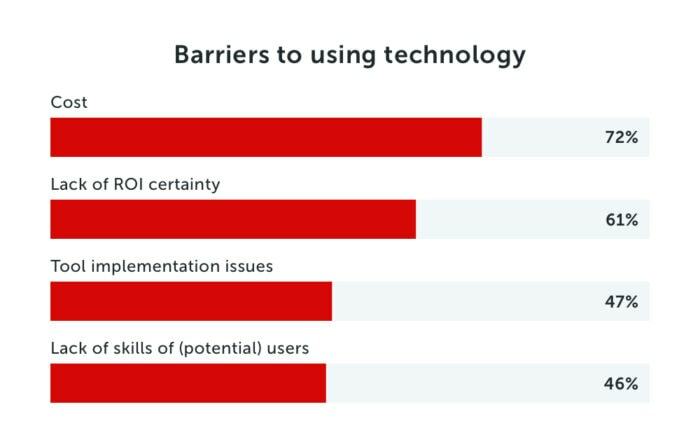 The IBM report lists the main barriers to embracing technology in the workplace, among which are costs, the difficulty in proving ROI, issues with implementation, and a lack of L&D professionals’ tech skills. These challenges are well-known to L&D professionals as well. So how can you choose an LMS that will help to clear the above-mentioned barriers as well as drive business growth and improve employee performance? Let’s look at this question more closely. As we’ve already written, a traditional LMS is not designed for corporate training. If you want to boost business KPIs, improve employees’ performance, ensure mobility and create a user-friendly interface at a reasonable cost, then learning experience platforms will be a smart choice. Of course, to achieve similar results, companies need to get serious about choosing a smart learning platform to make a smart investment that pays its way. If you want to learn more about how to make the right choice in selecting a learning solution, you can check our ten guidelines. Upon embracing modern learning technologies based on personalization, machine learning, organizational and performance data, companies are seeing drastic improvements in business. Employees equipped with the latest knowledge and skills perform better, it’s logical. Moreover, this fact is easily supported by statistics: an IBM study showed that for every dollar spent on training there was a return of $30 in productivity; the National Center on the Educational Quality of the Workforce reported that an increase in employee productivity depended more on efficient training rather than on upgraded equipment. By investing in a smart learning platform, companies can suggest more targeted training content to their employees that bridges existing skills gaps and increases productivity. This is thanks to the latest technological advancements that make learning experience systems even more effective by creating personalized learning paths for every employee, using individuals’ learning and performance data and integrating learning into the workflow as a result. According to “The State of the American Workplace” report conducted by Gallup, satisfied and engaged employees improve customer relationships, leading to a 20% increase in sales. Besides that, we’ve recently covered how businesses with a happy workforce were 22% more profitable. So where does employee happiness come from? It comes from work-life balance, career opportunities, financial rewards, a healthy workplace environment, among others sources. However, one of the most crucial factors is learning and development opportunities: 42% of employees consider on-the-job training as the most important benefit when deciding where to work. Moreover, having highly-competent employees also means avoiding unwanted inefficiencies that can disrupt your business and lead to a loss of profits. A business’s ongoing development is what drives its growth potential. Development, in turn, comes from the establishment and completion of goals, which is only possible when companies have all the necessary resources, both technological and human. The growth potential of any company is comprised of its future ability to expand its talent pool, grow its business, generate more profits, and fulfill its mission and vision. Efficient employee training lies at the heart of it. Highly-skilled and competent employees allow companies to be flexible in the market and quickly adapt to changes. If your talent receives good professional development, they’re more likely to stay. This safeguards your company from talent shortages. Moreover, employees can tell others of how great it is to work at your company, attracting more talent and improving your company’s employment brand image. Well-trained employees will also produce goods of great quality and render better services, increasing your competitive ability. Companies that don’t invest in the development of their people and still think that learning platforms won’t bring any tangible results will pay a much steeper price in the long run. Invest in you people as they are the main drivers of any business’s success. If you want to get a cost-effective learning platform that drives real business results, request our free demo!